We have been following the stories that Facebook was pushing out a new update to the much debated Timeline product, which replaced Profiles for both people and brands a while ago. We expected a more rapid global rollout so we could play with it before publishing, but it appears the majority of users who get to try it out right now are in New Zealand. From the photos shared on TNW we can tell that there are some very noticeable changes to the way content is shown. This include the way the header is shown, minimising the size of tab icons and ultimately partitioning Timelines into two clear sections. The sidebar seems to contain the latest interactions and social information, and the main ‘single column’ contains actual interactions with other users. Whilst this is a welcomed spring clean to the Timeline layout, we do worry about what it will mean for business/brand Timelines and the downsizing of Tab Application icons should the design be shifted across to those profiles too. What do you think? 2 columns or 1 and a sidebar? 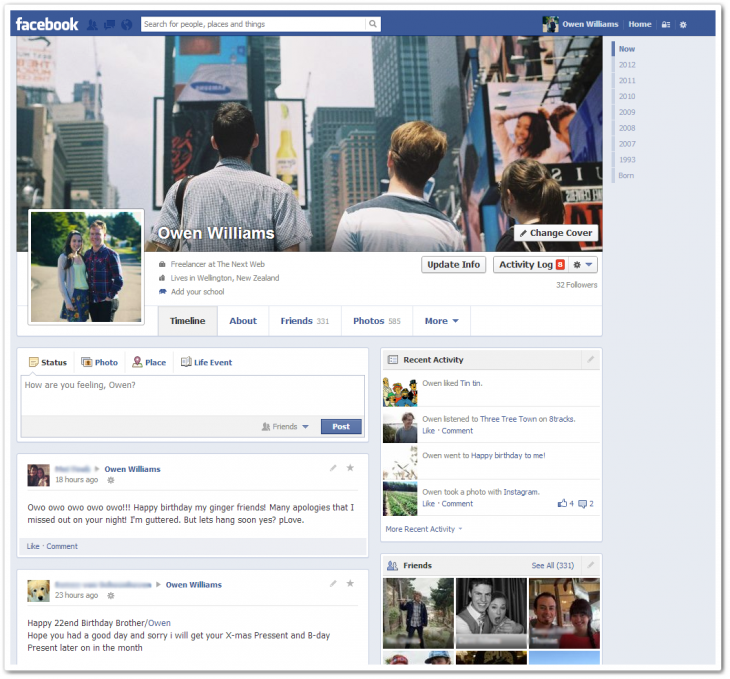 Prev:Easy Privacy Settings rolled out on Facebook. Have you changed yours? Next:Facebook increases Share Link size.